Join the discussion on our forums! Come discuss Clockwork Goblin over in our dedicated Clockwork Goblin discussion topic. Battlecry: Shuffle a Bomb into your opponent's deck. When draw, it explodes for 5 damage. You can play it on turn 8 and return a copy to hand with Barista Lynchen to play it again. 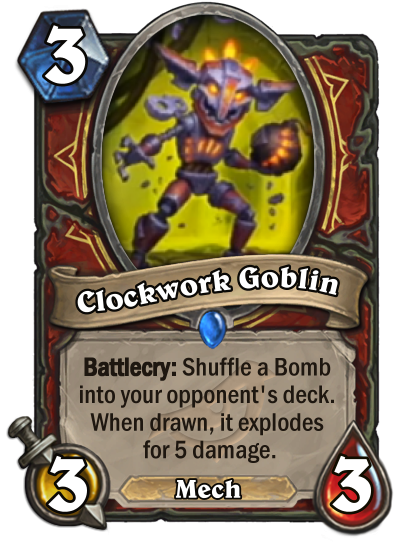 Well I mean discovering it might be ok especially in Dr. Boom, Mad Genius Form, but the bomb deck otherwise is a big question mark.